Michelle Obama caused a small stir in Saudi Arabia by not covering her hair (which is considered sexually provocative) while in the company of royal billionaires wearing sensible tablecloths on their heads. According to a Saudi spokeswoman, devout Muslims feel that the hair on a woman's head is as personal and private and hard to straighten as the hair on her Netherlands, but the kingdom's rulers believe the first lady did not intend to give offense. "Mrs. Obama was simply unable to obtain a head scarf," the spokeswoman explained, "because owing to our King's death, all of the stores were closed - including Hijabi Lobby." At that moment, the Saudi news conference was interrupted by an explosive rimshot. The drummer responsible was, of course, beheaded. Trust us, Lucy. It is. According to news reports (denied by the Pentagon), US Army Sergeant Bowe Berghdahl, who was swapped for five (count 'em!) high-value Taliban terrorists in a prisoner exchange last year, is soon going to go on trial as a deserter. 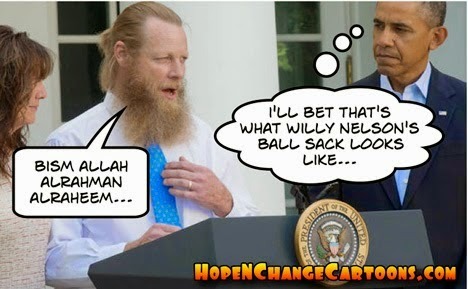 Of course, when Barack Obama secretly made the deal for Bergdahl's release - without consulting the military - there was absolutely no way he could have known this. Only kidding! Everybody knew it! But Barry made the deal anyway because he mostly just wanted an excuse to put terrorists back on the battlefield, and also to show that he'd leave "no man in uniform behind" in the midst of his VA scandal. Sentiments which, of course, match those of his commander in chief - the Great Liberator of Guantanamo Bay. (Excerpt) Susan "I'll Say Anything" Rice made the rounds of news shows claiming that Sgt. Bergdahl served "with honor and distinction," which doesn't seem to quite square with the impression given by every other soldier who served with him. Then again, perhaps Ms. Rice has simply been misinformed by a Youtube video. (Excerpt) The White House is now asserting that anyone who voluntarily puts on the uniform of the United States has accomplished all that is necessary to be given the "served with honor and distinction" label to wear a lifetime, no matter what circumstances occur later. And Hope n' Change can't help but wonder: will Nidal Hassan continue to rot in jail here in the United States, or will his service with "honor and distinction" allow him to be bundled with the Blind Sheikh, Khalid Shaikh Mohammed, and other jihadists for Barry's next prisoner swap? There are plenty of hugely important news stories to talk about today, but we're not going to address them because we're taking Hydrocodone for our back pain and we're having some trouble with those...uh... things...what do you call them?...you know, those things...oh, yeah - words! 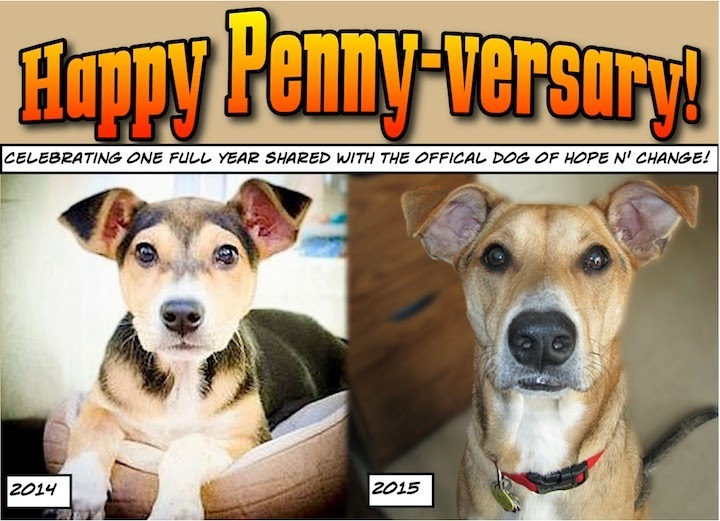 Fortunately, we have a simpler and happier subject that we can write about - the one year anniversary of our adoption of Penny, The Official Dog of Hope n' Change! Penny has gone from pup to energetic princess around here and is now a full-sized 50-pound mutt who is pleasantly thunkable (we believe that a good dog, like a good watermelon, should have a robust resonance when thunked). 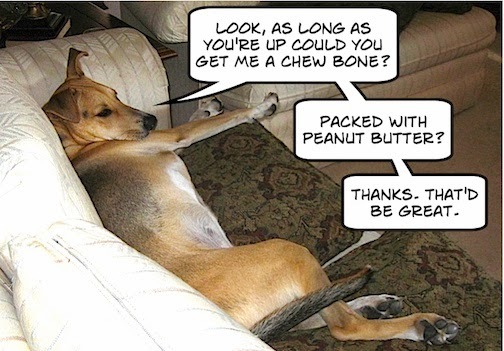 Surviving puppyhood was easier for Penny than for the Jarlsberg household, as she can be a whirlwind and a dynamo. And from the way she treats furniture, we suspect that there is both mountain goat and beaver in her family lineage. But time has mellowed her a bit, and she's now developing "big girl" manners. Penny has changed a lot over the last year. She grew stilt-like legs (appropriately enough), and her coloration has changed: she's turned out to be not as black as everyone expected, sort of like a certain president we could name. This first Penny-versary is very meaningful in the Jarlsberg household. We adopted her at a time which was challenging for the family, and the passing of a full year helps us reflect on (and be grateful for) the many good things that have happened since then. Plus - we have a dog! Penny is ever alert, watching for drones, black helicopters, ISIS insurgents, liberal looters, Constitutional scofflaws, and miscreants in general. Also squirrels and UPS trucks - you can't be too careful. And quite unlike a certain president we could name, she makes us happy every day. And will for many Penny-versaries to come. In only one short year she's got us perfectly trained.